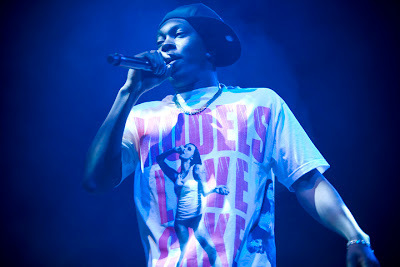 The English born rapper, Dizzee Rascal, will be coming back to the states this summer to play a few more dates. Among his shows will be one here in Austin at Emo's. You can buy tickets here for $15. Dizzee new album, Maths + English (new to the U.S. anyway, it was released this past week here after being released last year in England) consists of collaborations with Bun B. and Pimp C. ("Where Da G's"), Alex Turner of Arctic Monkeys ("Temptation"), and even Lily Allen ("Wanna Be"). Richard and I got to see him at Coachella 2004 so it'll be interesting to see how far he's come. He'll also be on FUEL TV's "The Daily Habit" this Wednesday.